I feel like I can tell when the first strawberry hits the farmers market. Like it telepathically says, “hey I am here”. It does, just so we are clear. As soon as the sun shines, we get juicy strawberries, and I will eat them daily for months, until they are no longer in season. That’s how I roll. Naturally I have been conspiring for new ways to take advantage of the new arriving beauties, and well did I ever. I will be sharing this recipe on my monthly TV segment over at KATU AM Northwest on Wednesday April 16th at 9:40am. So tune in locals, or wait, and I’ll upload the video shortly after. You won’t want to miss it, I’m showing you how to make cheese for dessert, and that is magic! Here is the segment! I have made mascarpone cheese from scratch a dozen times. I have also roasted strawberries a dozen times. I, however, have never put the two in the same bowl with other goodies. Well this time I did. And you are going to like it, trust me! I ask you to trust me every single time I write a recipe or post, this is no different. I have also said things are life changing. This is, again. Some people have never had macarpone, so let’s discuss. It’s creamy, slightly tangy, and very thick. Think thicker than Greek yogurt, but less than cream cheese. And does not taste like either of those, so no worries. It’s not cheese in the typical sense. It is a “cheese” commonly used in desserts, but also savory dishes like pasta. You just have to try it and trust me. So lets make mascarpone and sour cream mixture a couple of days before your Easter celebrations, Mother’s Day, or the weekend. It only takes 10 minutes. Then stash it in the fridge. On the day of an occasion roast some strawberries. Then make magic by putting them in a pretty cup together. You will not regret this decision my friends. Not. One. Bit. I like playing with textures in my food. I like playing with food in general. But it is important for me to have creamy with a crunch. Otherwise it can be a monotonousness dessert. So I added toasted almonds, they go well with strawberries. But you could also do pistachios, which are meaty and amazing! This is really nice for a weekend brunch and easy enough to make the mascarpone ahead of time. You could also assemble these early the day you need them. Make ahead desserts are always so nice. Especially in a jar, top with a lid and serve it, so cute! 1. Place the strawberries on a parchment lined baking sheet, and place in oven for 20 minutes. 2. While the strawberries are roasting place the mascarpone, sour cream, sugar, lime juice and zest, honey, and salt in a medium bowl, whisk to combine. Once the strawberries are finished roasting, scoop them into a bowl. Get as much as the juice as possible off the sheet pan. 3. 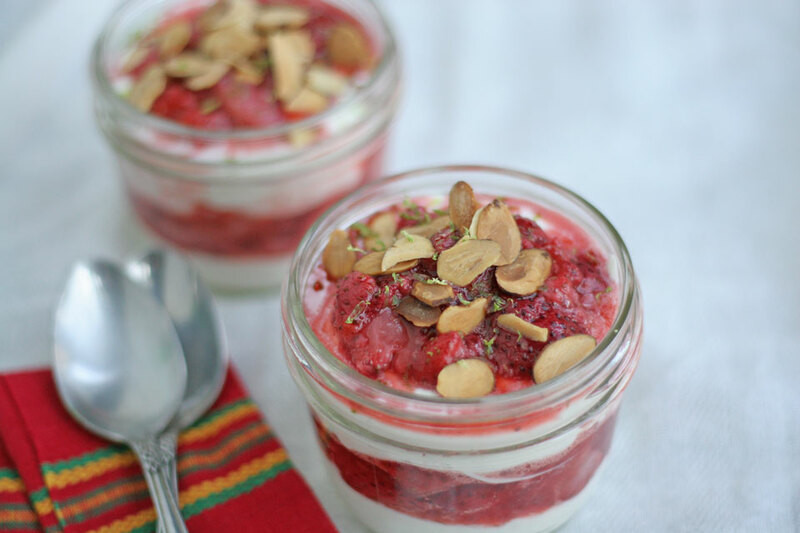 In a glass jar, or pretty glass, add a spoonful of mascarpone to the bottom, making sure to cover the entire bottom. 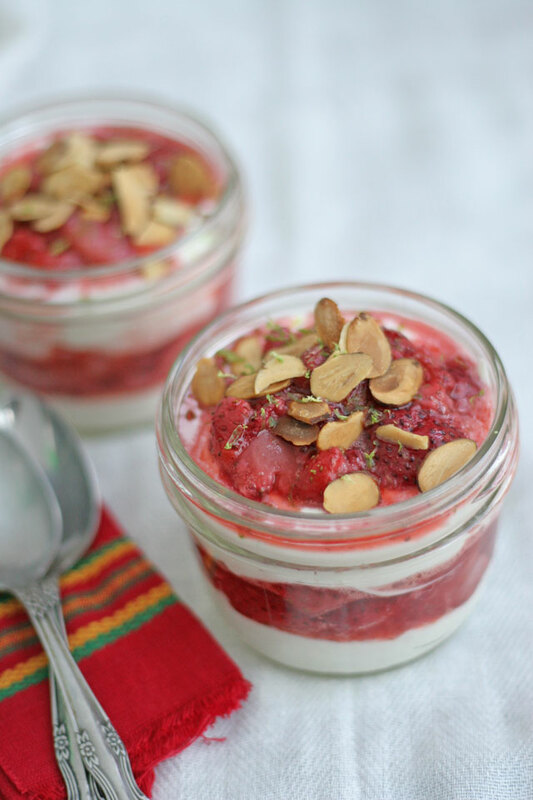 Add the spoonful of the roasted strawberries, and a sprinkle of toasted almonds. Repeat. Sprinkle some lime zest on the top to garnish. Note: You can make the mascarpone and sour cream mixture, and toast the sliced almonds a couple of days before. Roast the strawberries the day of. You can assemble the jars or glasses in the morning the day you want to serve this. Have you ever had roasted strawberries? I love them so much, I think they are magic! How do you make the mascarpone if you can’t find it in the store? Cook over med/low heat stirring often until it hit 190 degrees. Remove from heat, allow to cool 1 hour. Strain in double cheesecloth over a strainer over a bowl in fridge 12-18 hours. 400 degrees for 20 min. What is the oven temp for roasting the strawberries? Looks great can’t wait to try! Thank you so much, Teresa! 400 degrees :). I hope you like it!